Weekends have been so perfect lately I can’t really complain about the last two days of rain. 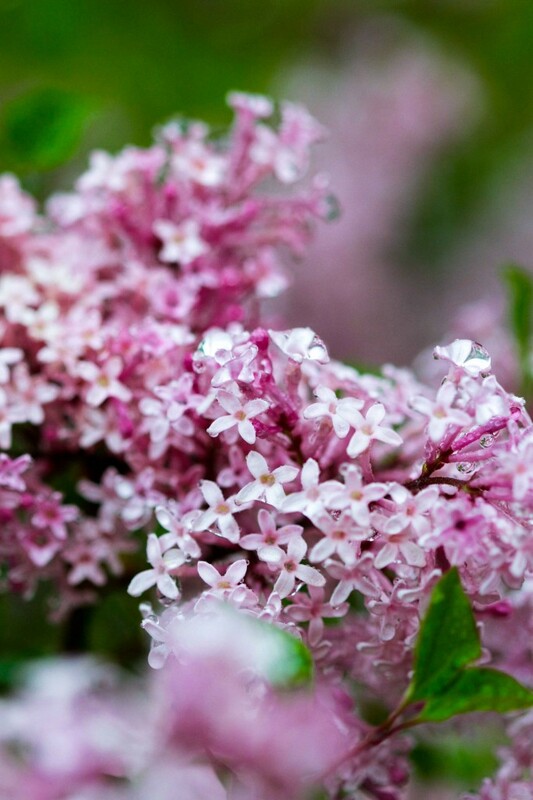 The only downside is this is the exact week the lilacs are blooming in our backyard. 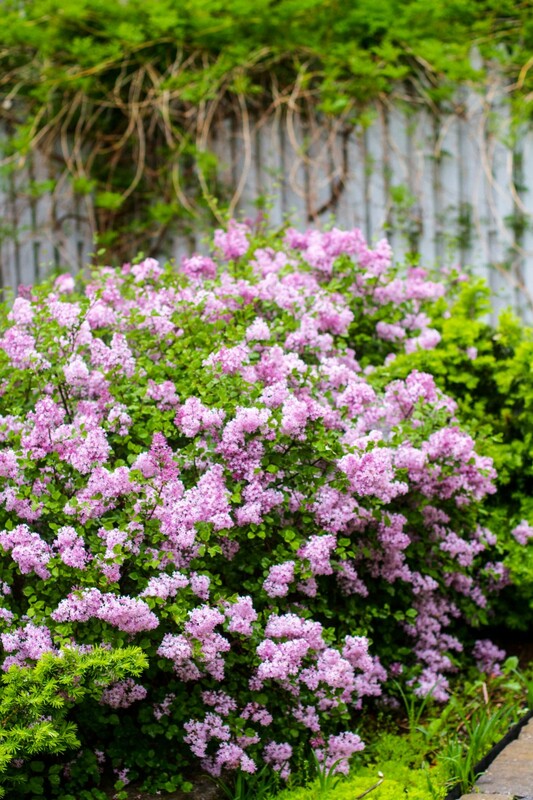 Every year I look forward to the days when I can sit on the back patio and drink in the intoxicating fragrance of the lilacs. But I’ve either been at work or it has been raining. Fortunately, before the rain started, there was time on Friday night to enjoy the flowers while decompressing from the busy week. And by Sunday afternoon the rain had stopped which allowed me to make up for lost time by capturing a few shots of these beauties in full bloom. 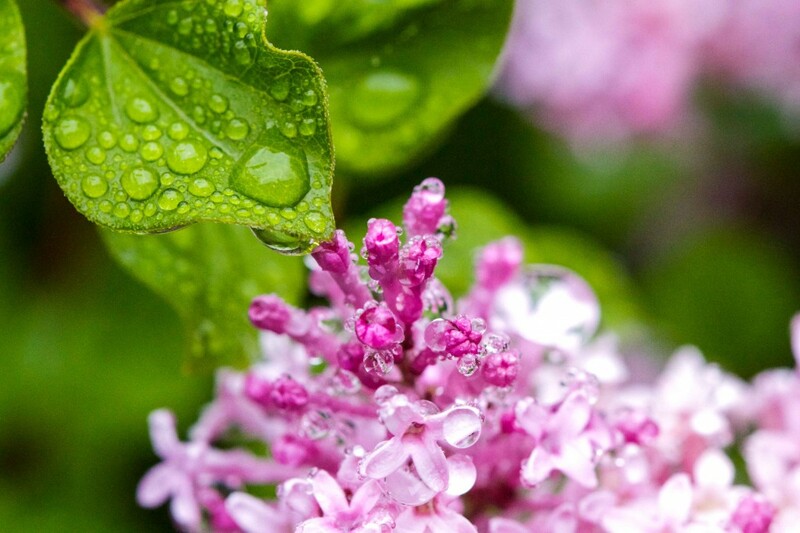 These are just two of our mature Palabin lilac bushes. Palabins have cute little heart-shaped leaves. We planted them several years ago and every year they are more beautiful than the year before. 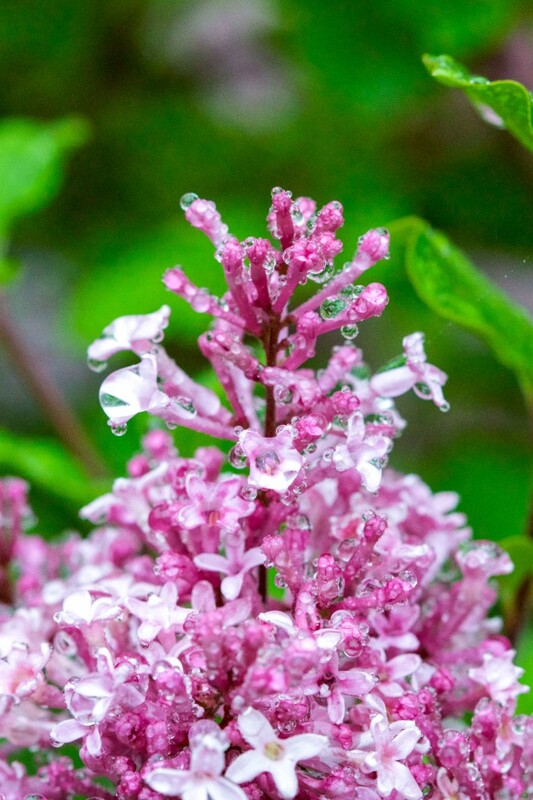 I found a poem about lilacs planted by a mother and it makes me wonder if my boys will ever come back to this house years from now and think about how we planted and enjoyed the lilacs. The rain drops are actually rather flattering don’t you think? 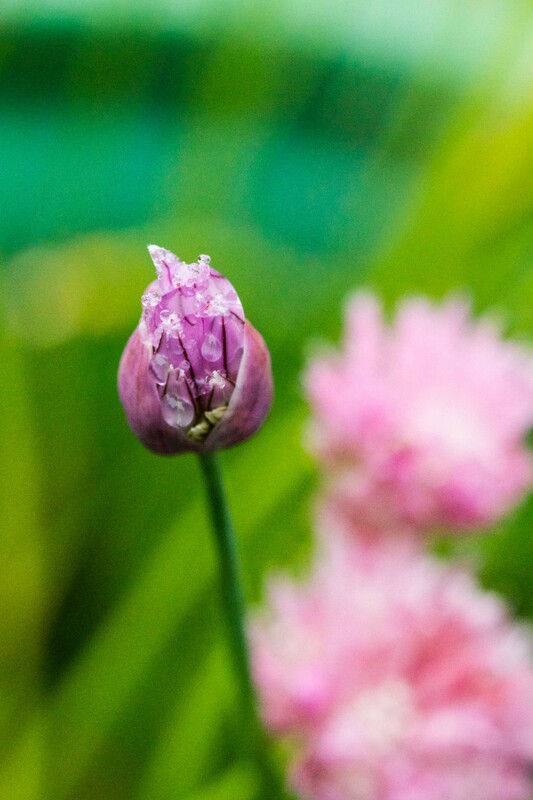 While taking pictures of the rain soaked lilacs I noticed the chives also blooming on the back patio. 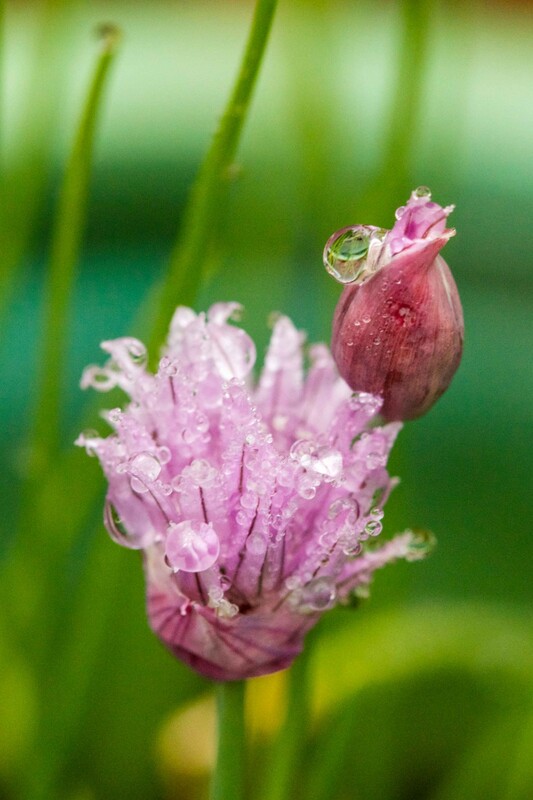 Who knew chives could be so beautiful!? 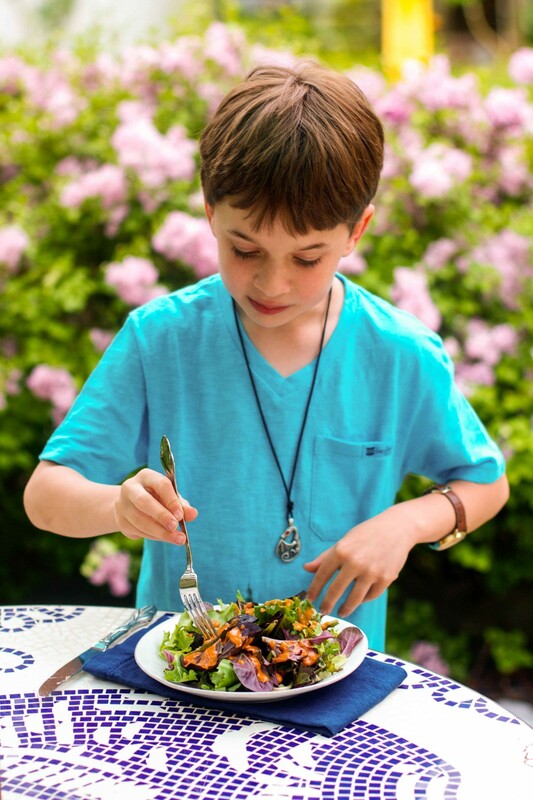 This paleo friendly salad dressing recipe was inspired by my youngest son Nathaniel. 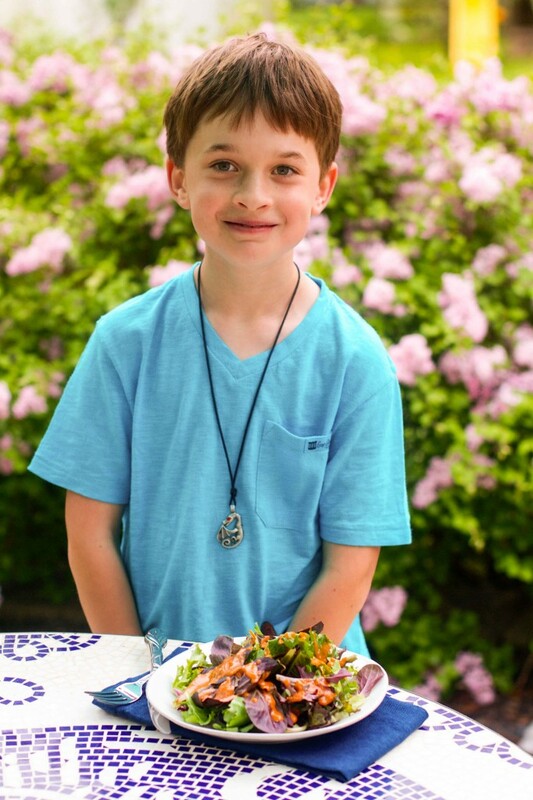 At a mere eight years old, Nathaniel is a serious salad eater. We usually dress our salads with oil and vinegar. But he has eaten the American version of French dressing at a few salad bars and liked it. The downside is these dressings undoubtedly contain things like high fructose corn syrup and soybean oil, among other questionable ingredients. But something happened recently that motivated me to come up with a healthier version of French dressing. We went to a restaurant that was out of French dressing and Nathaniel actually burst into tears. It was at that point I realized I better help the child out! This boy NEEDS his salad and he wants his salad to have “French dressing” on it. How could I resist? The healthy salad dressing recipe does contain honey so it’s not the lowest carb dressing out there but it’s great for a change of pace. Most of the ingredients are pretty basic while there are a couple of slightly more unusual additions that are optional. I just happen to know the American version of French dressing usually contains some form of ketchup and Worcestershire sauce. Worcestershire sauce contains things like molasses and cloves and I think these additions give the dressing an added depth of flavor. But if you don’t have those on hand you can still make the dressing and it will be totally fine. Combine all the ingredients in a food processor or blender and process until very smooth. This is one serious salad eater. 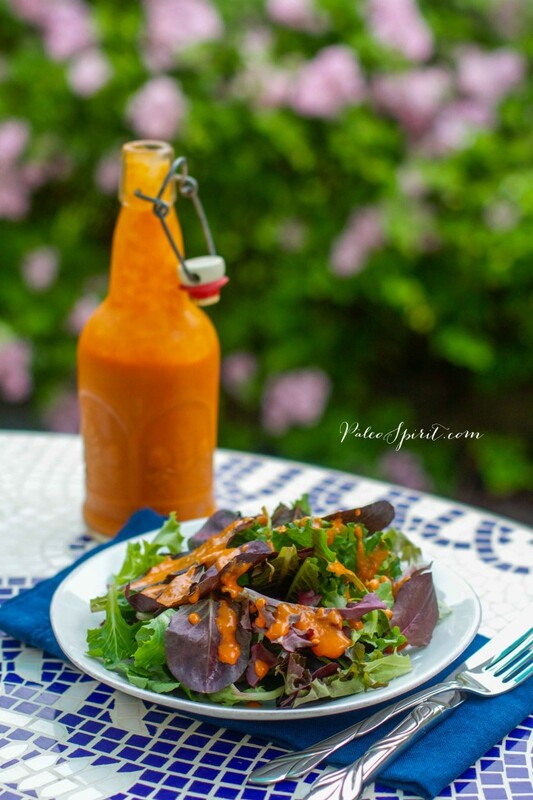 He recommends you try this healthier version of French dressing! 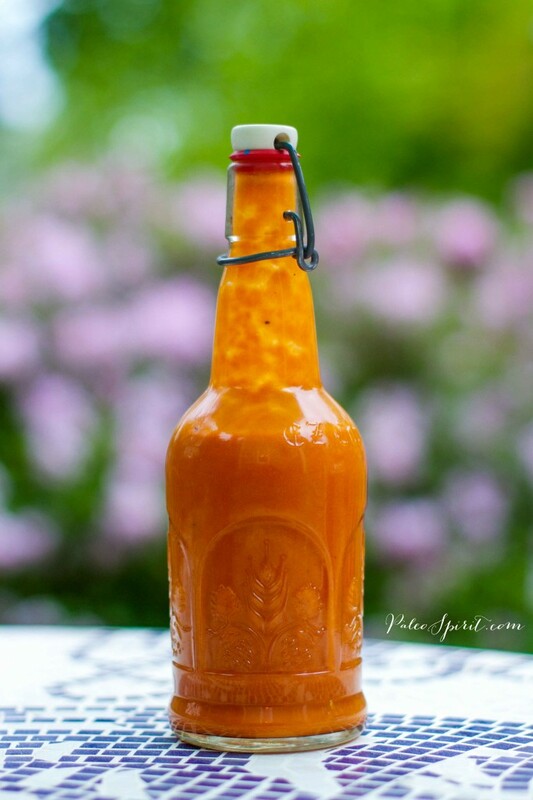 30 Responses to "Healthy Homemade French Dressing (American Style)"
Thank you, Kristen. You are probably right about the sweetness. The good thing about making it at home is you can control how sweet it is. LOVED French dressing as a kid, but you’re right – the ingredients are not healthy. Interesting that the restaurant didn’t have it; maybe it’s fading in popularity? Anyway, I’m definitely going to give this a try. I’m usually an oil-and-vinegar man myself, but as far as salads go, I feel the need to branch out. Thank you!!! I’m with Nathaniel (which, BTW, is my eldest son’s name)…French is my favorite!!! I’ve been known to throw a pity party when a restaurant has been out myself! Can’t wait to give this a try…also looking for a red french (ie Catalina) substitute if you have any ideas (trying to replicate one of my mom’s recipes that requires it). Nathaniel is a great name, isn’t it! I thought perhaps “french” dressing and Catalina were the same or very similar. I guess Catalina might have more tomato? I’m not sure. This version won’t be exactly like the store bought variety but I think it gets pretty close. I hope you like it. While it was still a great dressing, simply changing the vinegar didn’t create the “catalina” I was hoping for. No worries though, I still gobbled the salad right up – with my new favorite dressing! I love french and catalina dressings. I have since I was a kid. I do not like ranch or oil and vinegar. I was so happy to find this dressing recipe. I made it yesterday and tried it on a salad. It was amazing!! I actually like it more than store bought french dressings! 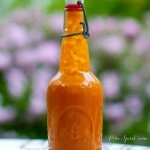 I made enough to refill my old store bought french dressing bottle. So glad you liked the dressing. My younger son definitely agrees with you! My 3 year old loves French so I’d like to try this recipe today. How long does it last in the fridge? Great. I’m always happy to hear when the kids like a recipe. My son sure does like it. I’m sorry but I’m not sure if I can pinpoint the time it will last in the fridge. I’m not exactly sure although the more acidic a dressing is the longer it will last. I would probably go for a week at the most. I hope that helps. This is a GREAT recipe! I never even liked French dressing growing up….probably because it was some processed bottled alternative as opposed to homemade. This however is delicious! I am excited for my kids to try it tonight (anything to convince them salad is not just a health food for them to be leery of! ), I certainly LOVE it! Thanks Lea! Hey Tessa, You are very welcome. And I really hope the kids like it as much as my Nathaniel does. I followed your recipe to the letter, and although it’s good its flavor is a bit strong for my taste. If I was to adjust the recipe do you think adding less vinegar or using a different vinegar would be my best bet? I think that would be a good way to make the flavor less strong or sharp. Vinegars can vary so much you have to find one that works for you. Hello & thank you for posting this wonderful recipe. It sounds awesome! What are coconut aminos? Where can I get them? And, is it an alternative to soy sauce? I am allergic to soy & have been hoping for an alternative to soy sauce so I can continue to enjoy Chinese food on occasion. Thanks again. Coconut aminos are a soy sauce substitute made from coconuts. It tastes quite similar to soy sauce. I’m able to find them in my local grocery store but you can also order it via Amazon and other online retailers. My dressing got really thick and almost solidified after I put it in the fridge. I don’t mind it and just bring it to temp before I use it, but my husband doesn’t like it after it’s been in the fridge. Have you used any other oils for this recipe? I was thinking maybe sunflower oil. Yes, these types of oils get solid in the fridge. It can be annoying but I’m like you, I just let it warm up a bit before using. I don’t use sunflower oil so I’m not sure if that is something that can stay liquid in the fridge or not. I have recently started using avocado oil which is milder than olive oil but I have not tried it in a dressing to see if it would stay liquid. I have even purchased Tessamae’s dressings from the grocery store and they get more solid in the fridge so it might just be something that happens with higher quality oils. Sorry I can’t be more helpful! Please check out the facts regarding safflower, sunflower, vegetable oil and canola oil. If you knew what was in them, you probably wouldn’t purchase them. A good source to go to is Dr. Axe. He has many articles and recipes. I’m a firm believer that if we are going to take the time to make something homemade and want it to be healthy, we need to do our homework on the matter. This recipe is fantastic! I used high quality olive oil and man is it good. I’ve made it with the honey lots of times. I’ve experimented with using granulated stevia instead of honey and it helped create an even lower calorie dressing that tasted good! Hmm. Interesting. I don’t use stevia much but I’ve found it to be pretty good in certain contexts (I like it with the tanginess of lemons, for instance – as in good for lemonade). I’m interested in your comment because I’m going to try it in this recipe and see how it is. Thank you! Did you make this dressing trying the Stevia? Just wondering. I made this a few days ago and it was delicious! I still have a little bit left in the fridge. How long do you keep yours? Glad you like it. The dressing is probably good for at least a week in the fridge. I’m so excited that I came across your blog and recipes. I’ve been following Paleo and healthy recipes for a long time. I am going to make this dressing today! It looks so good and I grew up eating French dressing. Homemade sure tastes a lot better than store bought that has preservatives in it. Would you mind sharing where you purchased the adorable glass bottle that you have your dressing in? Thank you. I asked my husband about it and he reminded me it was a gift to him from a friend when they were making mead together. They used bottles like this for their mead. Unfortunately, we aren’t sure where the bottle actually came from. Thanks for your comment!